One of the best experiences ever, visiting Kakaban Jellyfish lake. Snorkeling with thousands of jellyfish and they do not sting. This lake compares to the famous jellyfish lake on Palau and is only 1 hours from Derawan by boat. Follow the boardwalk and you will find a very special oasis in the middle of the ocean. This marine lake is 1/3 less salty that the surrounding seawater and the jellyfish inside lost their stinging ability because of the absence of predators. 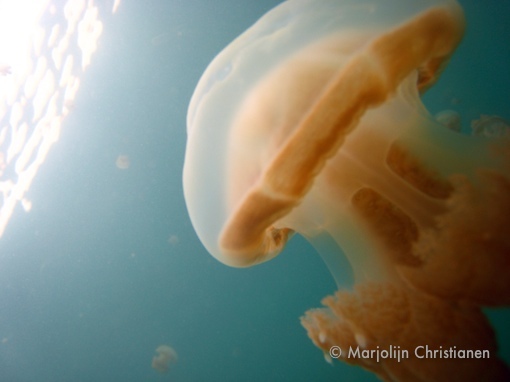 It is very cool to swim trough this jelly of jelly fish, and don’t forget to snorkel among the border to check the amazing & colourfull spongues growing on the mangrove roots. Also look in the trees, there are many birds (kingfishers for example) and I once saw a sea snake enter the lake. Diving is nice at barracuda point, north of the lake entrance (beware of the current, this is not a novice dive!). A different kind of dive is a dive in the “Blue light Cave”. Take a local diveguide because you will have to find the exit of the cave in the dark at 40m deep and than you enter the reef drop off and see the hudge, beautiful coral fans, and may even find a denise pygmee seahorse (but watch your deco-time). Getting there is easy, rent a speedboat on Derawan. The going price is around 800.000 Rupiah for a daytrip per boat (taking about 4 persons). It is quite easy to combine with one or two dives or visiting the Manta’s on Sangalaki. Great tips! Thank you for such a great website. I wanted to ask what a not-very-confident swimmer can do around Derawan? I’m totally fascinated by the stingless jellyfish and think I can handle snorkeling in the lake, since I assume there won’t be many waves. But what about seeing the mantas and the corals? What would you suggest to someone like me to see in Derawan? @Bettina, you could definately swim in the lake. There are no waves and to the edges you can stand on the mud if you want. The coral you can also see close to Derawan on the Sangalaki side of the island. The see is not rough most of the time and you can easily swim from one of the Jetties that reach the coral. Sangalaki is most of the times harder. You must be lucky for a very quiet sea.